Imagine the Sun’s surface as an utterly black sphere. Imagine a cloudscape above this that is comprised of colorful fans of glowing wisps of translucent fog, all vastly larger than the Earth, which are continually swaying and pulsing, occasionally being torn apart by lightning storms of literally astronomical proportions. Difficult? Not with some of the remarkable telescopes onboard NASA’s Solar Dynamics Observatory (SDO). They see that dynamic cloudscape, the Sun’s outer atmosphere, all the time, every day of the year, taking a picture almost every second over the past five years. These telescopes look at the Sun’s extreme ultraviolet (EUV) glow. That glow comes only from parts of the Sun’s atmosphere where the temperature exceeds a million degrees. Not from the solar surface that is ‘merely’ a few thousand degrees, and that consequently is simply black in SDO’s EUV images. High above the solar surface, at heights between about 4,800 kms to over 160,000 kms, temperatures soar to several million degrees, with large differences existing side by side, kept apart by magnetic forces. Three of the four telescopes that make up SDO’s Atmospheric Imaging Assembly (AIA) take EUV pictures at a handful of EUV colors. When combined in triplets, transformed into red, green, and blue hues that our eyes can see, the beauty of the Sun’s outer atmosphere is revealed. This EUV light from the Sun’s atmosphere cannot be seen by unaided human eyes. In fact, no eyes on Earth can see that light because it does not penetrate our atmosphere. Which is good, because EUV light is a dangerous form of light that can quickly and deeply damage human tissues. In order to record EUV light, telescopes have to be launched into space. And that is what NASA did with SDO early in 2010: it is orbiting the Earth, looping in the sky somewhere over Arizona. There, a large antenna captures SDO’s radio signals. Within minutes, the transmitted images are stored in the digital archive from where they are distributed to anyone anywhere in the world who wants to view the Sun in light that human eyes can never see. 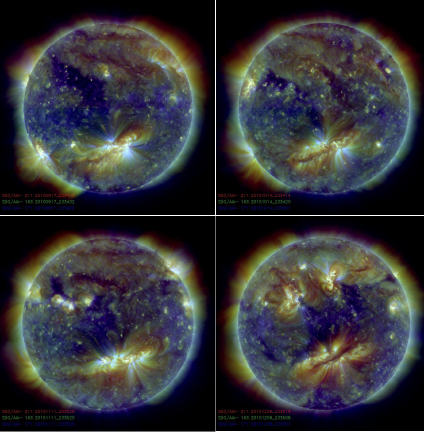 These EUV images of the Sun’s outer atmosphere were recorded with SDO’s AIA telescopes one solar rotation (approximately 27 days) apart so that the same side of the Sun is seen in each image. The large, bright magnetic region in the southern hemisphere changes shape gradually, with a long, dark filament forming in its center, but recognizable from image to imate. Elsewhere on the Sun, new magnetic regions emerge and existing ones are distorted, while their temperatures (shown by the colors) change all the time. There are no fixed features in the magnetic landscape of the Sun. SDO observes the Sun continuously so that we can follow all the changes … until the Sun’s rotation makes a region vanish from view altogether. Credit: NASA. Why do we do this? One reason is that the Sun is the only star in the universe that is close enough to be observed in detail. These observations help us uncover how a star can maintain a strong magnetic field, how that magnetic field can form sunspots (and similarly starspots on other stars) when it rises to the surface from deep inside the star, and how the motions in that field cause the Sun’s atmosphere to be hundreds of times hotter than its surface. The EUV is brightest wherever the field is strongest (as is the comparable X-ray glow from the hottest parts of the Sun’s atmosphere): large sunspots formed by bundles of strong magnetism have a very bright hot atmosphere above them. Observing the Sun’s atmosphere is also teaching us how strong and dynamic magnetism can lead to explosions on the Sun that are so violent that we would measure them in units of billions of nuclear bombs. Studying how and why this all happens helps us understand the other stars in our Galaxy and beyond. And it helps us understand how stars may affect the planets that orbit them. That brings us to another important reason to observe the Sun: stars, including the Sun, not only shine steadily in the visible light that warms the planets, but send out explosions of X-ray and EUV light, sprays of particles at near light speed, and racing magnetic clouds. At the surface of the Earth, shielded by a thick atmosphere and geomagnetic field, living beings are not significantly affected even by the largest explosions on the Sun. But satellites and astronauts in space can be. And the large high-voltage electric power grids on Earth can also be perturbed. The causes of the Sun’s variability and the consequences of that around Earth and in society’s technologies are now described by the term “space weather.” SDO was built both to help us understand the astrophysics of our local cosmos and to learn how we can protect ourselves from inclement space weather. 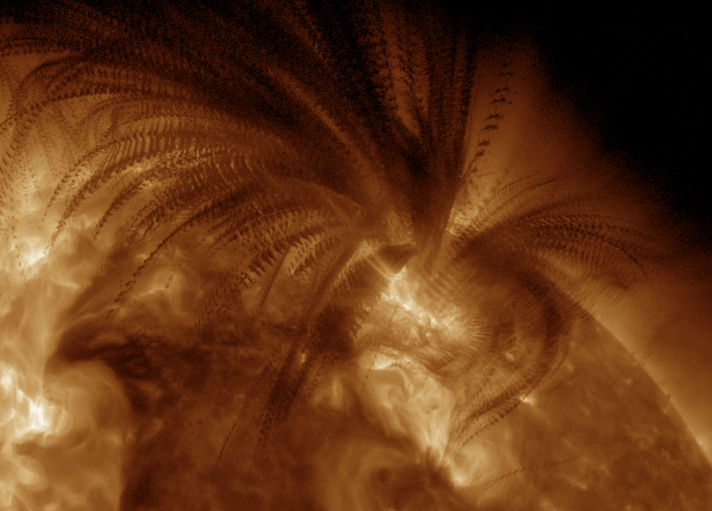 On 2011/07/06 the Sun exhibited a very large eruption, in which a large, massive filament was thrown up from the surface. The cool, dark material absorbed EUV light coming from behind it, causing a dark appearance of the ejection material. Whereas commonly most of such ejected material becomes part of a coronal mass ejection moving into the planetary system, in this case most fell down again subject to solar gravity. This image is a stroboscopic composite from a sequence of originals taken one minute apart. Putting all this together makes a shape reminiscent of a sword fern. Solar scientists use these trajectories to measure where material moves largely in free fall (ballistically) and where the magnetic forces become comparable to gravity to bend matter away. One example of such bending can be seen to the right of center, low in the image, and others in the upper left. Credit: NASA. Scientists from around the world discover new things about our Sun, and thus about distant stars like it, by using SDO’s EUV images, made in light that cannot be seen by human eyes. These images are recorded by digital cameras floating in space, then transformed into radio signals (another form of light that human eyes cannot see) and sent down to Earth. And then, having been transmitted through the internet by electrons, we can finally see the Sun’s beautiful, mesmerizing atmospheric glow when all is put together again on monitors in false color for us to behold. Light of all sorts, visible and invisible, is the astronomer’s lifeblood without which we would not know the universe around us. SDO’s AIA is one wonderful example of that. 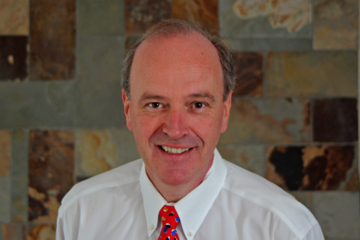 Karel Schrijver is a solar physicist at the Lockheed Martin Advanced Technology Center in Palo Alto, CA, U.S. He is the principal investigator for the Atmospheric Imaging Assembly of the Solar Dynamics Observatory. He was trained as an astrophysicist specializing in magnetic activity of stars like the Sun, receiving his doctorate in 1986. Since then, he has focused increasingly on the one star that we can see in detail ­– the Sun. In the past two decades, he has worked on the TRACE Small Explorer, the Interface Region Imaging Spectrograph (IRIS), and SDO’s AIA, that all focus on solar activity. In parallel, he researched the coupling of the Sun’s magnetic field into the space around it ­– the heliosphere – and the impact of solar magnetism on society through the various phenomena that we capture under the term space weather. He also plays a leading role in the Heliophysics Summer School, in which NASA educates future generations of researchers in the physics of the connections between the Sun and all elements of the solar system, and Earth in particular; in doing so, he has been an editor on the series of “Heliophysics” textbooks. Truly saying .it is one of the most majestic information about Sun..i am also want to be a solarphysicist that’s why! !.